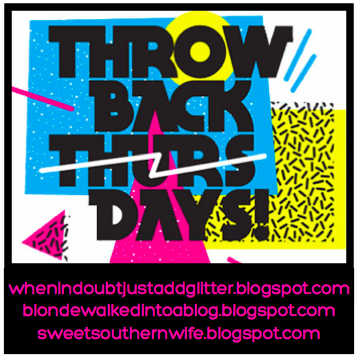 Two things inspired this post: my upcoming wedding anniversary, which has gotten me thinking about my lovers from years gone past, and an email I got from Ady, reminding me of Throwback Thursday. Now, I love TT on Instagram so why not take it to the next level and write a little story, right? 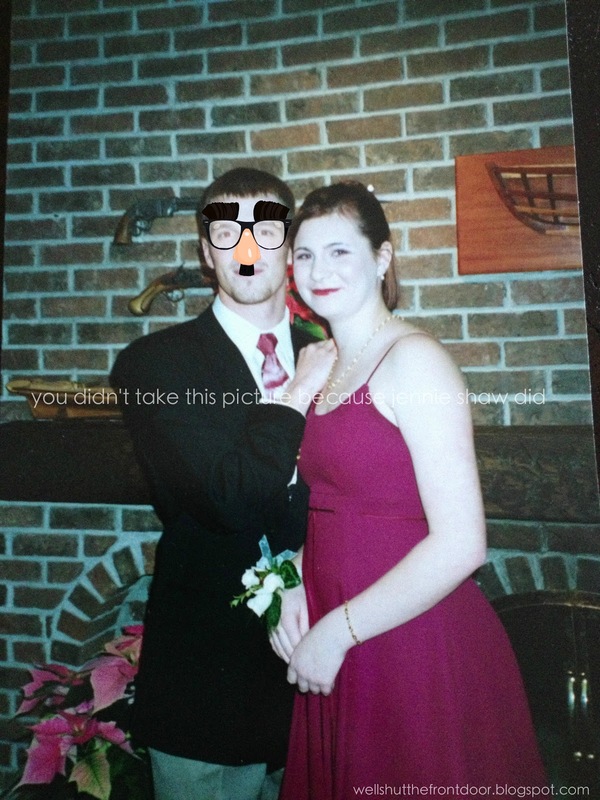 And then everything really came together when The Hubs and I were going through our storage boxes and I found a bunch of pictures from high school. Let's take it back to the mid-90s. I was in grade eleven, playing softball, working as a camp counselor and pretty much loving my life when I met my first real boyfriend, Ryan (name changed to protect the not-so-innocent), for the second time. Yes, the second time. As fate would have it, we'd gone to elementary school together at a Montessori school, which has three different grades in the same classroom, hence why there were a couple of years between us but we were still in the same class. During our childhood frolicks in the schoolyard, he managed to both be my friend, and my first kiss. But then we moved and had to change schools so that was the end of that. Flash forward seven-ish years later and Ryan ended up being my brother's counselor at overnight camp. Because I was in what I like to refer to as the Dawson's Creek Years, meaning I was watching Dawson's Creek and was convinced that the show WAS MY LIFE, I took the chance reuniting as a sign that we were meant to be. Better yet, Ryan felt the same way. He wrote me a ton of letters that summer (what gal doesn't like getting letters) and when September rolled around, we met up. And it was love at first sight. Err...a fifteen-year-old's version of love, anyway. Did I mention that he was a seriously talented guitar player who composed songs about me? I'm sure you can see how I didn't stand a chance. Over the course of three months, I went to his school's semi-formal, spent an inordinate amount of time at his house, wrote him poems about our love (*dies of embarrassment*), and eventually, he ended up being another first. Yes, the BIG first. My mother was less than thrilled. In fact, so were my friends, but the blinders of teenaged love were FULLY on and I was convinced that we'd be together forever. As you can imagine, it didn't take much longer for things to go bad. Quickly after I gave him access to my special places, I learned that he was bisexual. And by learned, I mean he let it slip one night, totally accidentally. Not only that, but he didn't seem to think that it was a big deal. Frankly, it's not, but what WAS a big deal is that I started hearing he'd been cheating on me with guys, only he didn't consider it cheating because it wasn't with girls. Now, I'd like to make it clear that I'm totally pro-gay. Repeat: PRO-GAY. That said, I am very much ANTI-CHEATING. Especially cheating that was going on under my nose, that everyone else knew about except me. Throw in some intense hormones, feelings of betrayal and confusion because he said that he loved me, and I'm sure you can understand how I dove head-first into a deep hole of devastation. I mean, he was my first kiss, my first BIG thing, and he'd been cheating on me the entire time we'd been together (and not only with guys, by the way, which I found out about later). Blah, blah, blah, because I was a glutton for punishment, I decided that I'd try and work it out with him. Oh how I wish I could go back in time and talk to my silly sixteen-year-old self (we were still dating when I turned sixteen). "Jennie!" I would say. "Lace up your silver Doc Martens and RUUUUUUUUUUUUUN!" It was the 90s and Doc Martens were all the rage. Don't judge. Okay, you can judge a little. Luckily, I came to my senses not too long afterwards and since then, this VERY BAD first relationship story has won me many-a-drinks at the bar (there's more...way more, but this post would be stupidly long if I went through the whole thing). As it turns out, though, the writing had been hanging on the wall (literally) long before everything went to hell in a flammable hand basket. I'll just let the picture I found speak for itself. Aside from my Casper-like skin (which can be distracting, I know), can you see the foreshadowing? THE GUNS ON THE WALL ARE POINTING AT HIS HEAD!! Bahaha!!! Ah-mazing. This story really just gets better and better, doesn't it? Thanks to Ady, Julia, Jennifer, and Yesi for hosting the linkup that reminded me of this story and has kept me laughing since last night! OMG this story is great. Bad, but good. And that pictures is fantastic! I just have to say, I love when Canadians say "grade eleven" instead of "eleventh grade". I don't know why, but I just love it. That is all. Just kidding. I love this story and the guns on the wall are pretty epic. O this is just awesome is a I am so glad I am an adult now and not a teenager anymore way! The first guy I did the big thing with also cheated on and went to a different school, sadly all these years later I still remember the girls name!